During my research of the Dallachiesa family for cousins Arleen and Melissa, I was contacted by Erin Johnston, a descendant of Giulia Anna Marchetti Ossana from Castelfondo. Erin happened upon our website while researching her own Tyrolean family line. She sent me an inquiry wondering if her great-grandmother, Giulia Anna, was related to the Marchetti family that settled in Hazleton/Black Creek, Pennsylvania. Her email explained further: while searching through our photos, she had made an interesting discovery. Erin noticed that several people noted in the wedding photograph at the top of our Photograph Page were also listed in the 1900 Federal Census, along with her great-grandmother. 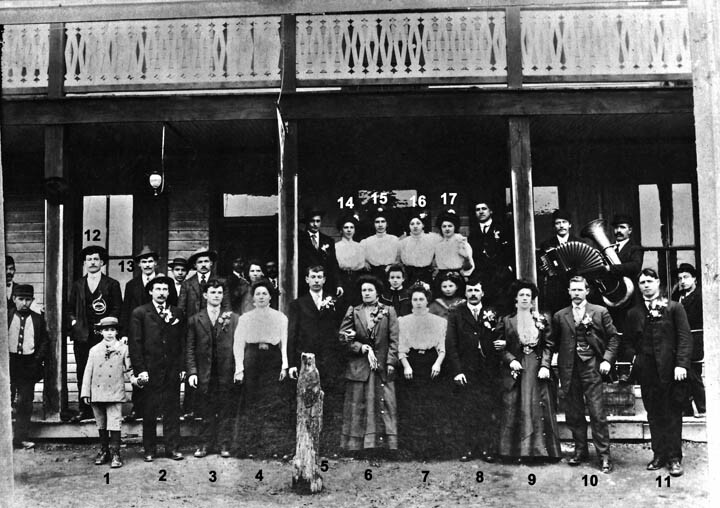 According to the census, “Anna” lived at the same boarding house in Black Creek, PA with Peter Zambotti (#2 in photo), his brother Alessandro Zambotti, Peter Dallachiesa (#8 – one of the grooms in photo) and his brother Joseph Dallachiesa. Since I had spent three weeks researching all of these ancestors, Erin’s email could not have been more timely. I was sure she had stumbled upon a missing clue – but neither she nor I had any idea what that was! To rule out the obvious, first I searched my own Marchetti tree (my grandmother was a Marchetti) and found no obvious connection between Erin’s family and mine. Next I went back to the genealogy I was working on for Arleen and Melissa – something immediately caught my eye! The parents of Clemente Dallachiesa, Arleen’s great-grandfather and Melissa’s 2nd great-grandfather, were Pietro Dallachiesa and Barbara Marchetti. (Keep in mind that Clemente’s two sons are Peter and Joseph. Both are listed in the census as living at the same address as Erin’s great-grandmother, Anna, along with Peter and Alessandro Zambotti. Plus the census states they are all close in age.). Perhaps Clemente’s mother, Barbara Marchetti, was related to Erin’s Marchetti line! I returned to my church records to search for the family of Barbara Marchetti (1818-1895). After some digging, I found what I was looking for! Barbara had a younger brother named Giovanni Marchetti (B: 1823) who was the father of Giulia Anna. Therefore, Erin’s great-grandmother was the 1st cousin of Clemente, and the 1st cousin, once removed of his sons, Peter and Joseph Dallachiesa. And Clemente’s sister, Catterina Dallachiesa (also Anna’s 1st cousin), married Simone Zambotti. Therefore, their sons, Peter and Alessandro Zambotti, were Anna’s 1st cousins, once removed too. So it appears that a group of cousins (Dallachiesa, Zambotti and Marchetti) all came to America at about the same time, were all about the same age, and lived at the same boarding house! Arleen and Melissa are 2nd cousins, once removed through the Dallachiesa family. Arleen and Erin are 4th cousins through the Marchetti family. Melissa and Erin are 4th cousins, once removed through the Marchetti family. Arleen and I are 3rd cousins through the Zambotti family. Melissa and I are 3rd cousins, once removed through the Zamobtti family. Arleen and I are 4th cousins, through the Genetti family. Melissa and I are 4th cousins, once removed through the Genetti family. Erin and I are not related – at the time of this writing I have not found a connecting ancestor, but there may still be one. Yes, I’m just as confused as you are by the over-lapping cousin relationships! However, Erin’s insights have shed an entirely new light on the wedding photograph (see above) of 1906! I’ll explain more in my next blog post. I sent a note on Ancestry…. this is the discussion we had and the research you came up with,! This is so exciting and I am so grateful. Wow Erin! Thanks for reminding me, I had completely forgot about this series of posts since I researched it so long ago! Well I guess DNA has proven we are cousins – it will take more digging to find the connection. Thanks again for the reminder!